trash: Derez a piece of ice protecting a remote server. Use this ability only during the next paid ability window after a successful run on HQ ends. You remember when Maxi was making book for Chacon. He's moved up in the world and gained the veneer of respectability. But as an executive the people he works for now, are far more vicious, bloodthirsty, and crooked. When can the Runner use the ability on Maxwell James? Maxwell James can be used in any paid ability window during the same turn in which the Runner has made a successful run on HQ. Interpret the card as if it said "Use this ability only if you made a successful run on HQ during this turn." 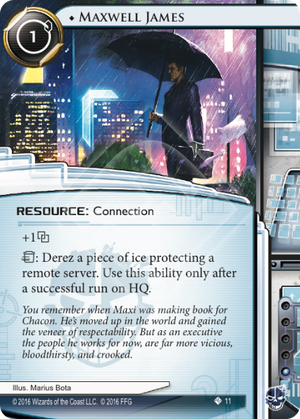 Designer's Note: Errata for this card will be issued in the next FAQ. This guy is one versatile connection. 1) He'll give 1 for 1, which is a pretty good deal. 2) He's one influence, so you will notice him popping up in Kim, Sunny, and Wu decks focused on link/connections, in addition to Geist, who he loves for the trash ability as noted below. Since he's unique you can't pull off completely absurd multi-James combos during a run without Street Peddler, which is probably for the best. Easily one of the best sources of (one and only one) link in the game, and a great splash in almost any faction for his great ability.